Elevation from the sea Elevation varied between 50 meters in the coastal area to 500 meter on Mount Carmel. Attacking Israeli force The Zionist forces were made up of 5,000 soldiers mostly organized by Haganah (Carmeli Brigade) and some IZL troops. The attack on Arab Haifa started on the 21st of April and was initiated from Hadara Ha Carmel (Haifa's Jewish neighborhood), which aimed to split the city into three separate and isolated pockets (operation Misbarayim meaning scissor). The 1st attacking force was directed from Wadi Rashmya towards the Northeastern neighborhoods of Arab Haifa, the 2nd attacking force was directed toward the Arab neighborhood next to the port, and the 3rd attacking was directed toward the commercial district. Click here, to read more about the battle for for Haifa in Arabic. City defenders The city was poorly defended with 350-500 Palestinian volunteers and some Arab Liberation Army (ALA). Haifa's defense was headed by Ahmad al-Huneiti (a Jordanian national), who was killed on March 17th, 1948 while supplying the city with a major arms shipment, 12 tons of explosives, from Beirut-Lebanon. This arms shipment was meant to reinforce Haifa's crumbling defenses, and to boost it moral. Based on a tip from a British commander stationed in the area, a Haganah force that was stationed nearby Kiryat Motzkin, a Zionist colony between Haifa and Acre, ambushed and killed Mr. al-Huneiti. The death of Ahmad al-Huneiti had a major demoralizing affect on Haifa's Arab population. On March 27th, 1948, Ameen 'Izz al-Deen took up the responsibility of defending Haifa until its surrender on the April 23rd, 1948. Just prior to the city's surrender, close to 300 fighters from the al-Tira, a Palestinian village located 7 km southeast of Haifa, attempted to reinforce Haifa's crumbling defenses. As they headed down to Arab Haifa, they were confronted by a British force commanded by General Stockholm, who commanded Haifa's British forces at the time, and they were forced to turn back. The people of al-Tira are a very good example of how a poorly armed, but well determined and stubborn fighters, can stand up to the Zionist might. Despite all the odds, al-Tira withstood a siege and an onslaught for more than three months until its occupation in late July 1948. It should be noted that close to 700 of Transjordan's Arab Legionnaires (who were give strict orders not intervene by H.M. King Abdullah and their commanding British officer Gloub Pasha) stood by while Haifa was being ethically cleansed and occupied. On February 29th ,1948, Zionist terrorists rolled downs a barrel of explosives from Haifa's Jewish neighborhood, Hadara Ha Carmel, into al-'Abasyah Arab neighborhood, which resulted in the destruction of most of the neighborhood. The bomb ended up terrorizing the nearby Arab neighborhoods into fleeing soon after that incident. "In Haifa, the civilian authorities were saying one thing and the Haganah was doing something else altogether. Moreover, Haganah units in the field acted inconsistently and in a manner often unintelligible to the Arab population" (Benny Morris, p. 90). Out of the 61,000 Palestinian Arabs who used to call Haifa home, only 3,566 Palestinians were allowed to stay. The remaining population were in constant fear on their lives and properties, and many of them witnessed the looting of their homes and possessions by the Zionists. Refugees' migration route The mass majority of Haifa's Palestinian population, numbering at least 35,000, were pushed into the sea. Similarly, Jaffa's population, numbering at least 50,000, suffered the same fate on May 13th,1948. Click here to view a map that illustrates refugees' migration routes. Via boats, many Palestinian refugees landed in Sour (Tyre), Sayda, and Beirut Lebanon, and some boats managed to land in Acre City. It's very sad that some of the people who landed in Acre were ethnically cleansed again few weeks later. Ironically, often Zionists accuse the Arabs of plotting to push the Jews into the sea! City name through history The city's name is derived from the Canaanite Arabic word al-Hayfah meaning nearby, and during the Roman period it was known by Efa. The Crusades called Haifa by Cayphas and sometime they referred to it also by Sycaminon (meaning Wild Strawberry which is abandoned in the area). During the Islamic period, Acre dominated the coastal area, and Haifa was just a small town. It is worth pointing out that Haifa is a modern and new city, which was initially developed by the Ottomans, and later on by the British Mandate and the Israelis. District's size Haifa's district covered an area of 1,031.76 square kilometers, of which Jews owned 364.28 square kilometers (35.3% of the overall district size). 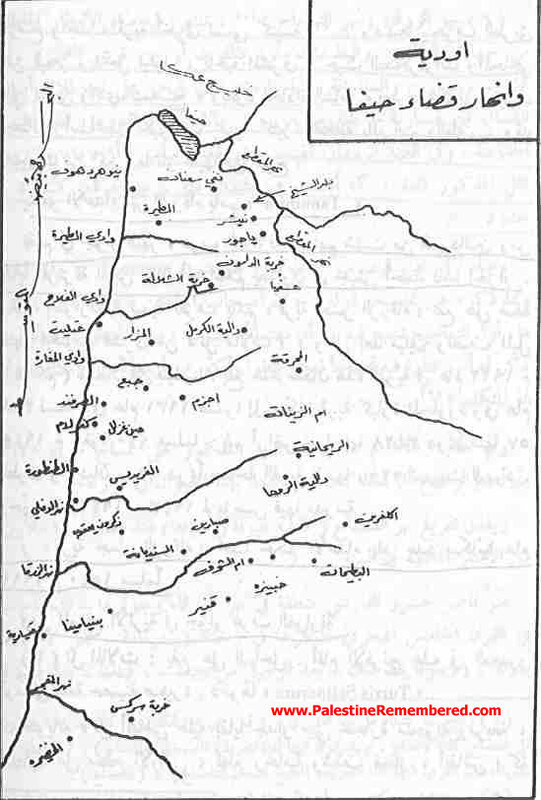 In 1945, the district was made of 52 villages, and 14 bedouin localities. The Israeli Zionists destroyed all of these villages and bedouin localities with the exception of 'Ablein, Shefa 'Amr, 'Ibtin, 'Ara and 'Ar'ara, Kafer Qare'a, 'Aseifa, and Dalyat al-Karmel (Palestinian Druze village). * In the Ottoman's period, Haifa district was made off 62 villages and that may have accounted for the population drop down in 1922. ** The number of houses in the municipality in 1931 was 21,335. Note that the above data are based upon 1945 statistics. Wadi al-Tira This wadi carries rainwater East of the al-Tira and at that point it's known by Wadi al-Kasab, and at its termination point it's also known by Wadi al-Musrara. Wadi al-Fallah A small wadi that originates from Khirbat al-Damun, and it terminates nearby 'Atlit al-Shamlyah. Wadi al-Mugharah A winter wadi which originates from Dalyat al-Karmel, and passes through 'Ijzim, Jaba', and Khirbat al-Shyahk, and it terminates between 'Atlit and al-Sarafand. This wadi is known to Israelis by Nahl Me'arot. Wadi al-Difla The rainwater falling on 'Umm al-Zaynat, al-Rayhanyah, Dalyat al-Rawha, and Khirbat 'Umm al-Dufouf ends up feeding this wadi, then it passes through 'Umm al-Jamal (Beit Shelomo) and Shafya, and finally it terminates 4 (km) south of al-Tantura. Click here, for a map of the nearby wadies and rivers. City size In 1945, the city covered an area of 54,305 dunums, of which 5,890 for roads and railroads. Jaffa 99 (km) via the new Lake Shore Drive (LSD) built in 1937. * The statistic includes Muslim and Christian Arabs. Number of houses In 1931, Haifa had 12,364 houses. 1- Complete senior high school for boys, and in 1942 it had an enrollment of 461 students and 21 instructors. 2-Elementary school for girls, and in 1942 it had an enrollment of 442 students and 12 instructors. 3-Industrial school for boys founded in 1936. The school used to accept honor elementary students, and it offered a three year program in carpentry, locksmith, industrial machinery, car mechanics, ... etc. In 1945, this school had an enrollment of 69 student. Muslim Altogether, Haifa had 10 Islamic schools, which all had an enrollment of 1,297 boys and 453 girls. These schools had 53 instructors. Christian Altogether, Haifa had 18 Christian schools (including foreign schools), which all had an enrollment of 2,406 boys and 2,042 girls. These schools had 38 instructors. The Old City, al-Khamrah square, Suq al-'Abyad, al-Markaz al-Kadeem, Daraj Saqreiq, Hadarah Ha Carmel, al-'Abasyah, al-Nabi Sha'nan (al-Halaqah), Tel al-Samak, Beit Kaleim, Madraset al-'Anbiya, al-Khayat Coast (southeast), Wadi al-Salib, Wadi al-Nisnass, Burg al-Salam, Central station/al-Markaz, al-Hamra square (now Paris Square), Rashmaya, Ra'as al-Carmel, The Germany Colony (built in the 1860s southwest of the city center) ... etc. Click here, for a detail map of Haifa's neighborhood before occupation. Hospitals The Government of Palestine owned and operated a hospital in the city which had a capacity of 261 beds, and it accepted 6,337 patients in 1944. The Jewish community in Haifa had five hospitals, three of these were private hospitals, where all these Jewish hospitals had a capacity of 177 beds. Industries Palestine Oil Refinery (located northeast) which was founded in 1933 to refine the Iraqi oil, cement, cigarettes (Qaraman, Deik, iw-Salti), publications (Haifa had three Arabic newspapers), textiles, olive and grape presses, several grain mills, ice production, wood processing, soap, fishing (mostly Arab owned), and industrial machinery for the railroads. Are the Palestinian people entitled for compensation for their looted properties? Airport Haifa's airport was located north west of the city center. In 1944, 175 plans landed in the airport which carried total of 514 passengers and 13,528 tons of goods. Before Nakba, Palestine had three operational airports at al-Lydd, Haifa, and Kalyah, and in 1944, all of these airports received 2,207 plans which altogether carried 5,582 passengers. Port In 1908, the Ottoman Turks were the first to invest and develop Haifa's port , and since then the city and its port have experienced a very rapid growth. In 1929, the Government of Palestine invested heavily into Haifa City and especially in its port (almost 1.25 million Palestinian Pounds) because of the need to refine and export the Iraqi oil, and it in 1933 the port was officially opened for business. It should be noted that when the port was first opened for business, and probably until the present day, it was considered to be the most modern and well equipped port in the Mediterranean, and second to the French port of Marcel. The port loading dock had a length of 400 meters and depth of 9 meters, and it was capable of accepting 3 to 4 big ship at the loading docks, or 20 ships next to the retaining walls. The main Haifa railroad line had a connection leading into the port to ease the import and export of goods. At the time, Haifa's Port was also well equipped with modem cranes to expedite the loading and unloading of the parking ships to and from railcars and trucks. Over all , the port used to employee 1,400 people. Currently, Haifa's port is considered to be Israel's main port, and in 1971 it received 56% of its total shipping. Tel Aviv, Isdud, and 'Ilat are the other main ports in Israel. Jaffa's old port was decommissioned as soon as Isdud's port became operational in the 1965. For conversion purposes, temperature of 24 centigrade = 75 fahrenheit. * Palestine's total fishing for this year was 1,699 tons. 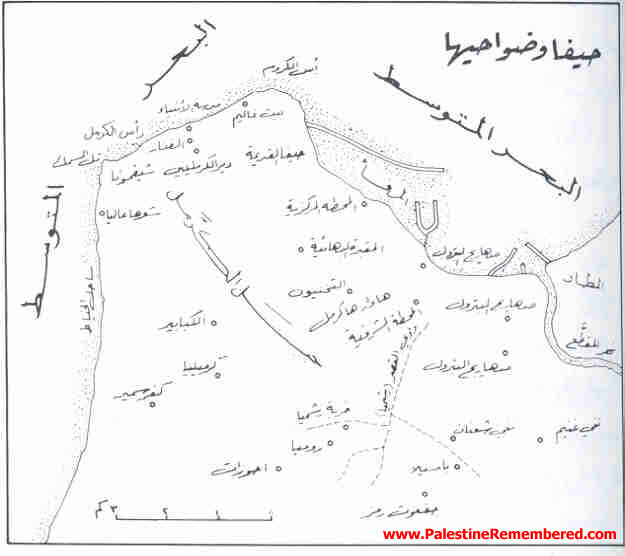 Note: All fishing in the Haifa area was Palestinian owned and operated. Our primary sources for the above data was Biladuna Filisteen (second set, volume four) by Mustafa Murad al-Dabagh and The Palestine Encyclopedia.